A version of this article first appeared in a Special Report on ‘Smart Cities’, published in The Times, 7 June, 2012. 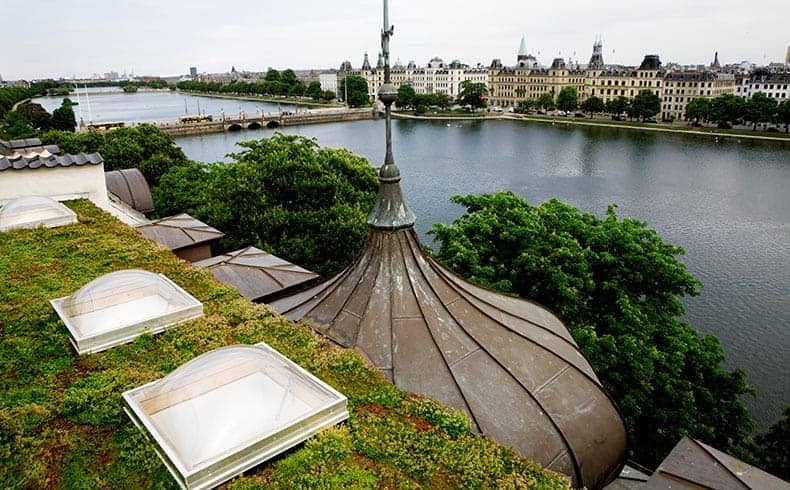 Ecological overhead: Urban Grey to Green is the theme of the 2012 World Green Roof Congress, to be held in Copenhagen, in September. Sustainability is a modern business-model essential, not merely a wish-list desirable. Why? Ask any of the 1,000 thought-leaders and executives from commerce and brands who convene in San Diego this week to debate sustainability and you will get the same real-world answer: The force driving them together is consumer demand. “Consumer expectations of business around the world are changing, as an increasingly internet-enabled and connected global citizenry becomes more informed about environmental and social impacts,” explains KoAnn Vikoren Skrzyniarz, Founder of Sustainable Brands, hosts of SB’12, in California. We are inhabitants of a space where ethics, environment and economics meet, in a new age of e-conscience and e-commerce connectedness. In effect, we are all global citizens now. So, how are cities responding? As if ecology, air quality, stormwater management and urban heat-island effect were not reasons enough to be greening up on the roof, there is another simple, pressing economic and physical development factor at play here: Land. For architectural peace to break out, smart, metabolic materials are needed that can both reduce carbon and improve ecology. These living materials can be of bacterial, plant, animal or even mineral origin: Some are technically ‘alive’ such as, bacteria; others are not, such as smart surfaces and paints. Already on the market and existing buildings are catalytic pollution-fixing surfaces, such as titanium oxide. Coming soon are applications for bacteria within concrete to help it self-repair, or ‘heal’. Picture this vision of tomorrow’s world: An active, informed and happy citizenry, plus intelligent and successful business community, living and working together in harmony, in and around low-carbon, high-ecology Smart City environments. Is it really an impossible dream that modernisation of the metropolis could see planet-smart design driving down resource consumption, pollution and public-sector costs, whilst simultaneously ratcheting up performance, productivity and quality-of-life indicators? Whilst the prospects for cities of the future delivering on such promises might be highly debatable, the climate and building science are not: The need is visible, the technology doable. Utopia? Now, that would be smart. Building bridges: Bristol Smart City programme aims to see this historic urban centre transformed to become an inclusive world-class green-digital economy. Efficiencies in technology and infrastructure will bring multiple benefits to inhabitants of Smart Cities – saving them time and money, energy and water, waste and space – but cannot alone guarantee wellbeing and improved quality of life. The Smart City is to feature Knowledge, Administrative and R&D hubs, bringing together academia, industry, business and technology. Economic growth and efficiency benefits to businesses and organisations mean the opportunity to develop and retain home-grown human-resource talent, particularly in IT-driven labour pools, is a clear win-win for employer and employee alike. Business opportunities in connection with the Smart Cities agenda are not however limited just to companies physically located within the urban areas themselves – there is a whole smart service industry emerging, blazing technology trails lit by best-practice beacons old and new. IBM has involvement in over 2,000 Smarter Cities projects worldwide, working on initiatives right across the sustainability spectrum – from helping reduce carbon footprints of buildings, IT energy usage and traffic emissions, to providing healthcare innovation that supports independent living for the elderly, or aids diagnostics in clinical decision-making. For education, business and government, Canadian company SMART Technologies provides visual collaboration solutions via interactive whiteboards in over 100 countries. Effective data sharing offers potential to save money, increase productivity and reduce carbon footprints. In this new commercial and cultural landscape, working together is working smart: No company is an island; no worker cut off. Whilst location need not necessarily prove a barrier to smart market participation, potentially age might: Can a city simply be too old and too developed to join the smart party? With a Royal Charter dating back to 1155, Bristol is home to a collaborative Smart City programme between the public sector, business and community. Priorities are smart energy, transport and data, with initiatives ranging from technology support for domestic energy efficiency, through ICT for electric vehicles, to major investment in digital infrastructure and connectivity. With choice editing for citizens stimulating a virtuous spiral of upwards mobility in quality of life, perhaps the smart message will rapidly disseminate going forward: Ask not what your city can do for you – ask what you can do for your city.